With the central government clearing some bottlenecks, synthetic textile manufacturers are planning a cumulative 500,000 tonnes of capacity addition, at an investment of about Rs 70,000 crore, over the next two to three years. The industry saw nearly 300,000 tonnes of new capacity across the entire value chain in the past two to three years. Overall capacity of the synthetic textile value chain is now 5 million tonnes a year; China’s is 55 million tonnes. The central government in September 2018 started releasing input tax credit, a big blocker of working capital for the entire industry. Further support in terms of a uniform tax structure and high import duty would help, says the industry. “As against 73 per cent of polyester and 27 per cent of cotton blend in textiles globally, India continues to have a lower percentage of polyester use, of just 40 per cent in the overall textile sector. The capacity additions planned now, of around 0.5 million tonnes in the next two-three years, will meet domestic demand and help in higher export,” said a senior industry official. Leading synthetic yarn manufacturer Filatex India plans to raise its capacity by 300 tonnes per day to 1,050 tonnes a day with an investment of Rs 275 crore. The new capacity is coming at Dahej (Gujarat) and orders for machinery have been placed. The project is scheduled to commence commercial production in the coming financial year. “Polyester is the fibre of the future and we will continue to expand our capacity, based on the demand. 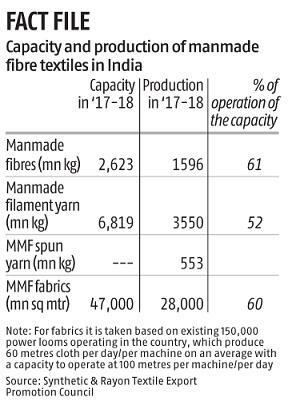 The demand for polyester fibre is increasing as the demand for sports and yoga wear is increasing across the world,” said Madhu Sudhan Bhageria, chairman. The company’s capacity rose last year from an annual 237,000 tonnes to 328,000 tonnes. Export contributes to a fifth of its revenue. The current capacity expansion would mean another Rs 600 crore of revenue a year. Another manufacturer, Bhilosa Industries, plans to add 700 tonnes a day, taking its capacity to 2,300 tonnes a day. Well known Polyester has expanded over the past few years to 1,100 tonnes a day. Other manufacturers have similar plans, to meet global demand. Data compiled by the Synthetic & Rayon Textiles Export Promotion Council (SRTEPC) showed the average of 60 per cent capacity utilisation in 2017-18 had slightly increased this year. With increased focus on polyesters or synthetic textiles, Vietnam had export of $34 billion in calendar 2018, with a target of $36 billion in 2019. Of this, $10 billion was of synthetic textiles blended with viscose or cotton. 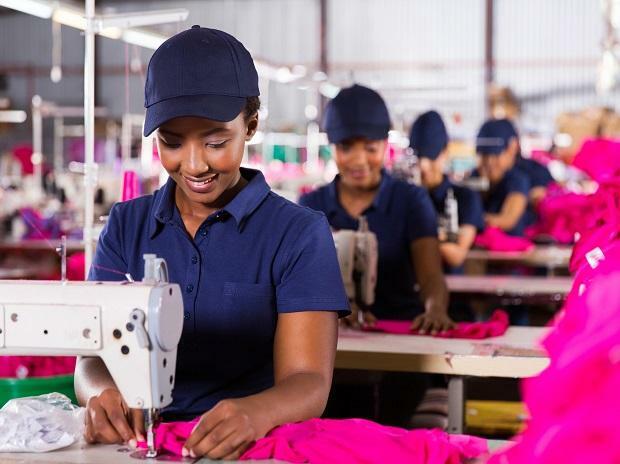 “To boost export, the government needs to make a uniform tax structure of five per cent in the synthetics sector, similar to the cotton value chain. Also, the import duty of five per cent needs to be raised to 10 per cent or even higher, to restrict import from China, Bangladesh and even Vietnam,” said the official quoted earlier. Former SRTEPC chairman Sri Narain Aggarwal said substantial growth in import inot India of manmade fibre and manmade staple fibre and textiles was not a good sign for the industry. The government needs to act with remedial and protectionist measures, he added.